Paris has some great cabarets like the famous Moulin Rouge and The Crazy Horse. My favorite is Au Lapin Agile, a small cabaret housed in a little pinkish-colored cottage, situated on a cobble stone street in Montmartre. It opened in 1860. At Au Lapin Agile you will sit at an old carved wooden table, sip a drink or two or three, and listen to rollicking French songs and music-hall tunes pounded out on a piano or played on a guitar and sung by throaty cabaret singers who will encourage you to sing a long. In this casual bohemian atmosphere the performers mingle, laugh and joke with the audience. 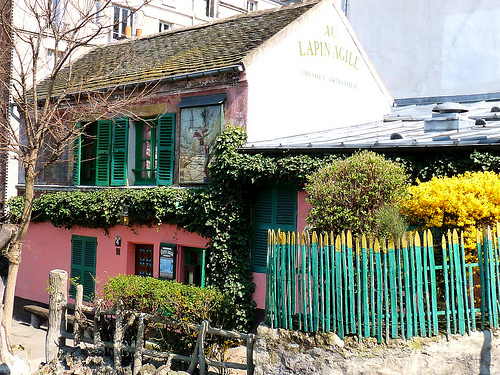 For an unforgettable night of French frivolity, hit Au Lapin Agile. It’s hard to believe that cottage is in the heart of Paris. Lapin Agile does mean agile or nimble rabbit. Au Lapin Agile used to be called Assassin Cabaret because of a couple of murders that took place on the premises. Artist, Gill painted a rabbit on the side of the structure. Then it became Lapin a Gill meaning Gill’s rabbit and finally Au Lapin Agile. If I ever see Paris again … well, a girl can dream. Dreams are where reality begins. What did you love most about Paris?